IN A blow to the forest bureaucracy’s attempt to thwart legal action against diversion of forestland for non-forest use, the National Green Tribunal (NGT) has pointed out that state governments must pass the final order regarding the clearances and make it public. This will provide a chance to the aggrieved party to contest the clearance in the tribunal even after the Centre has cleared it. Any project developer who requires forestland has to apply to the state forest department, which then forwards the proposal to the Union Ministry of Environment and Forests (MoEF). The ministry gives in-principle approval for forest diversion by imposing certain conditions on the developer. Once these conditions are complied with, it issues the final clearance. Activists allege that several projects were given in-principle and final forest clearances on flawed basis. These were challenged before the tribunal, set up by the Parliament in October 2010 to decide all environment related matters. In October, when faced with a similar challenge during the hearing of forestland diversion for a hydel project by GMR Energy in Uttarakhand, MoEF filed an affidavit, saying NGT cannot review the Centre’s decision. For this, it used a loophole in the NGT Act, which says petitioner can appeal against a decision of the “state and other authorities” issued under the Forest Conservation Act (FCA). NGT agreed with the ministry’s contention but clarified that under FCA state must pass a final order to implement MoEF clearance. Aggrieved parties can thus challenge the state’s order in NGT and question the process of clearance, including MoEF approval. As of now, states usually inform developers about MoEF’s decision and term it the final order. Parul Gupta of Legal Initiative for Forest and Environment, an environmental-legal firm, says several project proponents start investing in the projects soon after they get in-principle clearance. There is a possibility that by the time the state passes the final order, it is challenged and decided in the NGT, enough damage to the forest is done. Besides, in case of a challenge, project developers often use their prior investment in the project as an excuse to win the case. Gupta says with the ruling, any activity done prior to the issuance of the state’s order will be treated invalid. The attempt to keep forest clearances out of NGT’s ambit came at a time when the Centre was mooting a proposal to establish the National Investment Board that would have had overriding powers to fast track clearances (see ‘Costly push to mega projects’). 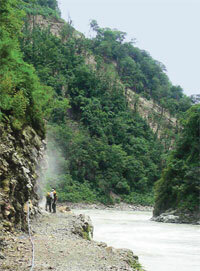 Industry proponents argue that green clearances are hurdles in the development of the country. Activists, however, say the problem lies in the procedure through which clearances are granted. “An issue that is ignored by all those crying hoarse over the delays in the forest clearance process is the poor quality of applications submitted by state governments,” says Neeraj Vagholikar of non-profit Kalpavriksh. For instance, he explains, the law requires the nodal offficer or the Principal Chief Conservator of Forests of the state to give detailed opinion and specific recommendation for acceptance or otherwise of the proposal. In the case of the controversial Demwe Lower project in an eco-sensitive area of Arunachal Pradesh, Vagholikar says, the detailed opinion of the nodal officer was just three words: “recommended for acceptance”. The project awaits final approval. An analysis of the 25 projects considered for forest clearance by MoEF in November shows only one proposal had detailed comment from the nodal officer. The analysis was done by Delhi-based Environment Impact Assessment Resource and Response Centre. In 16 proposals, nodal officers simply recommended projects without any comment while in eight cases either there were no comments or they were wrongly put. “So the question that needs to be asked is how MoEF is deciding the fate of biodiversity hotspots based on such shoddy applications and justification by state governments,” says Vagholikar.